Mathematical Physics with Partial Differential Equations is for advanced undergraduate and beginning graduate students taking a course on mathematical physics taught out of math departments. The text presents some of the most important topics and methods of mathematical physics. The premise is to study in detail the three most important partial differential equations in the field – the heat equation, the wave equation, and Laplace’s equation. The most common techniques of solving such equations are developed in this book, including Green’s functions, the Fourier transform, and the Laplace transform, which all have applications in mathematics and physics far beyond solving the above equations. The book’s focus is on both the equations and their methods of solution. Ordinary differential equations and PDEs are solved including Bessel Functions, making the book useful as a graduate level textbook. The book’s rigor supports the vital sophistication for someone wanting to continue further in areas of mathematical physics. 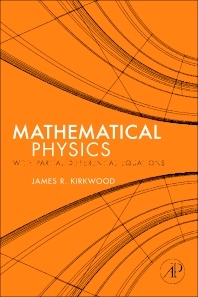 Bringing over 25 years of teaching expertise, James Kirkwood is the author of ten mathematics books published in a range of areas from calculus to real analysis and mathematical biology. He has been awarded 4 awards for continuing research in the area of mathematical physics, including the 2016 ‘Outstanding Faculty Award of the State Council for Higher Education in Virginia’ – the highest award the state bestows.